← Wraps and swaddles by Hana Baby… plus a fab giveaway! Beautiful skincare products and a gorgeous Giveaway worth £25!! When I became a mum I also became more aware of all the harmful chemicals used in the products I was using every day. I’d previously paid little attention to the ingredients in cleaning products, detergents, skincare lotions etc. Having new responsibilities as a parent I felt that I needed to start making a conscious effort to try and use more natural, eco friendly products wherever possible. I was actually quite shocked to discover that many of the popular brands targeted as baby safe products are actually full of all the horrid kinds of chemicals I was trying to avoid! 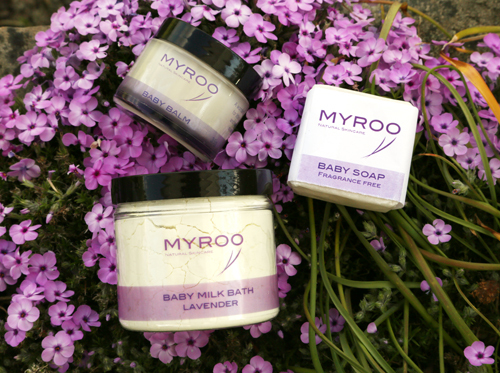 I first discovered the Myroo skincare range when I met Rachael in 2010. The lovely Rachael (Founder of Myroo) has formulated some fabulous skin care products from natural ingredients that are gentle and super kind on the skin. Rachael originally began making skincare products for her children when she couldn’t find anything gentle enough for their sensitive skin. When Rachael’s friends tried her creations on their children and loved them too – Rachael soon decided to launch her fab Myroo company. I bought a box full of Myroo baby skincare goodies back in 2011 to use when Rosie was a baby and loved them. Rosie had sensitive eczema prone skin and the Myroo (also known as Milly and Flossy) products worked well for her. As Rosie has grown older her allergies seem to have calmed down but I am keen to carry on using natural products wherever possible. 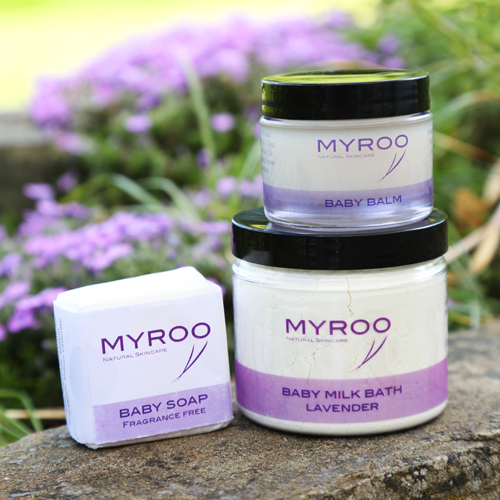 Last week I received a gorgeous package of ‘Myroo’ goodies to try out on my little baby Ruby! I was a little excited when the box of treats arrived. Rachael sent me a baby soap, baby balm and a lavender baby milk bath to try. I can happily say I loved all three products! The baby balm is wonderful, it smells lovely, feels soft and silky on the skin and works well for baby massage, dry bits, baby bums etc. (I may have used it on me too .. as it’s such a great moisturiser!) I’ve been using this on most nappy changes for the last few days. Last night I had a gorgeous soak in the bath with Ruby – the Baby Milk Bath has a subtle lavender scent and leaves the water feeling silky soft. The soap is great too, I also tried this on Rosie when she jumped in to join us! If you would like a chance to win £25 worth of Myroo products all you have to do is write down the products you would like to win (of a value up to £25) in the comment box below. There are all sorts of brilliant products to choose from (not just baby products)To see the skincare products available visit the My Roo website (click here). On the 4th June at 4pm I will pop all the entry names in a hat and draw a winner. The winner will then receive their chosen products direct from Rachael at My Roo. This entry was posted in Giveaway, Skincare products we love .... Bookmark the permalink. 19 Responses to Beautiful skincare products and a gorgeous Giveaway worth £25!! The baby balm might hopefully work on maisy she gets sore skin after swimming in the sea, I’ve tried everything. Also I love body butter so would be excited to try that ! I’m in uk in July so hope there’s a summer this year !! The starflower and orange blossom skin boost serum sounds divine, as well as the bath fizz in citrus! Love a relaxing bath! The myroo products look fab!! Hand treat geranium for me! my hands are soooooo in need of this! Hmmm I’d love to win the baby bath milk and the lemon body butter for myself! If I was to be lucky in this giveaway, I’d love to try the starflower and orange blossom cleanser or serum. For my children’s hands after the harsh school soap or swimming bath trips, we love the geranium hand treat. These products sound wonderful. I’d like to try the floral bath fizz, the geranium hand treat and the baby soap (greedy). Wow, what a delicious choice to choose from! I would love to try the Geranium hand cream as I suffer from Eczema and the starflower and orange blossom facial oil sounds divine! I would love starflower and orange blossom serum and geranium hand cream. Both sound amazing.